English, a language that was introduced to us Indians decades ago. Since then the use of the language has grown tremendously in our country. English is indeed the second most popular language spoken across the world. Even after years of practice of English, in India we haven’t yet succeeded completely in learning it. We always look up to people with eloquent English and urge to speak like them. And now we can learn fluent English in our very own national language, Hindi. You can now learn English from Hindi in 7 simple ways. To start with, download the app Namaste English on your smart phone and get started with learning the language at your ease! 2) It’s FREE, FREE, and FREE!!! Most of the chapters on Namaste English are free. So unlike educational institutions you are initiating to learn English without paying a penny! Or you can also earn coins while playing games to unlock advanced chapters! The app has 4 levels of learning English starting from beginner, intermediate, advance and expert level. Once you start from the basic i.e. the beginner level you can slowly and gradually prosper to the expert level increasing your vocabulary with each level. There are 100s of interactive English courses, language games and tips; Daily surprise quizzes to update you, games for spell checks and sentence building. Wow! So now you learn while you play. 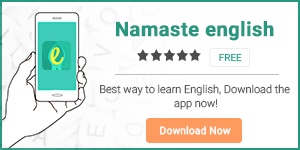 At Namaste English you always have assistance while practicing the language on this superb app. You get immediate results while playing games to help you learn swiftly. If at all you want to know the meaning of any word in English or Hindi, we have an INTEGRATED DICTIONARY. So we are always at your service! Learning is not only through reading and writing but hearing also plays an integral part. This wonderful app also has system generated audio dictionary to learn the correct way of greeting e.g. : Good Morning, Have a nice day etc. With these 7 steps, learn to speak in English and grab every success that is waiting for you! Grab this promising opportunity and make the most of it!